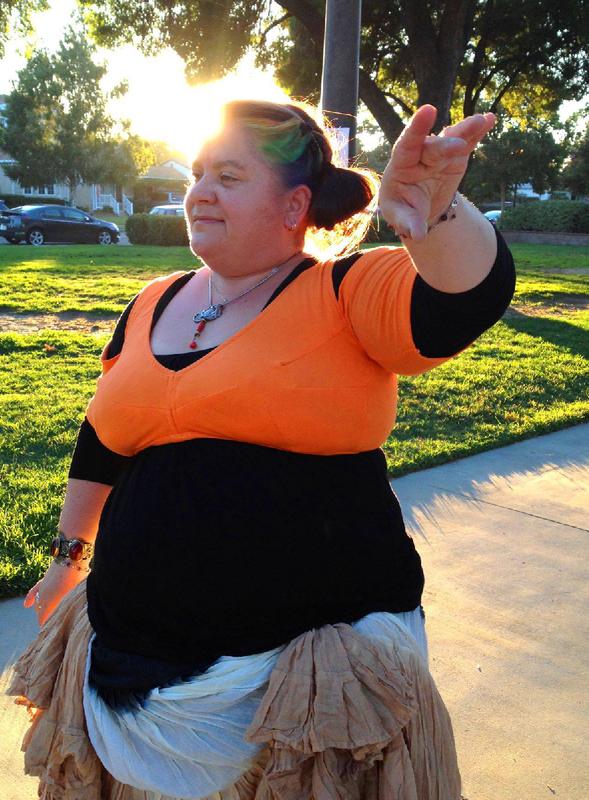 Carolena Nericcio (from FatChanceBellyDance) leads dancers in a moving mediation or Puja before rehearsal or performance. Instructors of ATS® usually lead their students as well, although occasionally the description of the puja varies a little bit. One variation I continue to hear uses the phrase “thankful for” interchangably with “acknowledging.” Rather than just, “with this gesture I acknowledge the space I have to dance in,” these instructors have said, “with this gesture I am thankful for the space I have to dance in.” I can no longer remember which instructors tended toward which phrase, but I love the notion of doing more than acknowledging the parts of our dance but being consciously thankful for it. I had an extra 30 minutes in the park before class was going to start. I took the time to do drills as the sun went down. My Sweetie took the time to take photos of me in the sun. My favorite method of describing the moves of the puja is as follows. I’ve been having one of those days where I can hardly enumerate all the ways in which I am thankful. Recently, I’ve been feeling extremely thankful for the space I have to dance in. Shifting from a ready-made schedule of classes, conducted by someone else, in a space that was arranged by someone else, to determining all my own dance opportunities has occasionally been daunting. For the first eight-week session, I missed all the classrooms and studios I had been in before. I missed all the fellow students, my instructor, and all the hours and hours of rehearsal. But as students have been coming to me, new opportunities have been coming to me. Now I’m starting my second round of eight-week sessions with one set of friends, a second round with one private student, and launching a brand new eight-week session with a completely new set of friends who are interested. And suddenly I have new spaces to dance in, spaces in which I am responsible for being the caretaker, the facilitator, and the gentle leader to make everyone feel welcome. It is my job to invite these new dancers to find their own dance, their own music, their own passion in coming together with like-minded dancers. Combine all this with an excellent day job, excellent day job co-workers and employers, excellent relationships, excellent family, excellent health, and excellent opportunities to craft and create — I bring all this thankfulness to my dance. * Note: The inclusion of both “those that I dance with and those that I dance for” I heard for the first time in April at General Skills, directly from Carolena. I’ve kept that phrase in my heart ever since, and I always use it when I lead the Puja.